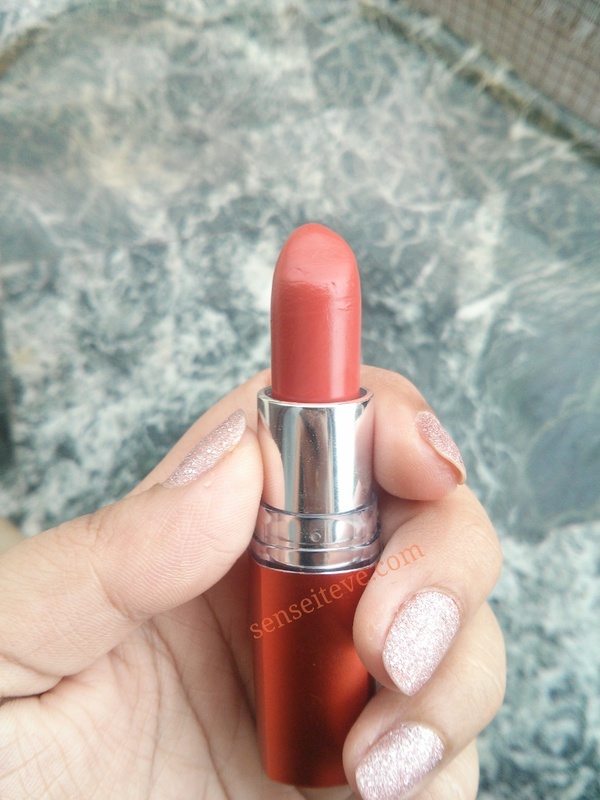 Hope your week is going good so far 🙂 I was browsing through my recent post and i have realized that it has been a long time since i have reviewed any lip-product, so i have decided to post a review of a lipstick “Maybelline Color Sensational Moisture Extreme Lipstick Bronze Orange”, which i have been using a lot lately and that is by one of my favorite brands Maybelline, it is from color sensational range which has been around for a long time. Maybelline has been my favorite brand for budget makeup products 🙂 Last year after using many products by Maybelline I have decided to try their lipstick range as they had many good reviews on internet but i did not want to waste too much money to test the lipstick but when SA told me that the range starts at 275/- INR, I was happy and shocked at the same time but still i have decided to give it a try. I am more of orange/pink/coral lover when it comes to day-wear makeup. So while choosing the shade I was inclined towards these shades only and when SA swatched Maybelline Color Sensational Moisture Extreme Lipstick Bronze Orange on my hand, it did not cost me more than a sec to makeup my mind to purchase it 😀 Let’s elaborate a little more about it. Price: 275/- INR for 4gm. Maybelline Color Sensational Moisture Extreme Lipstick Bronze Orange comes in beautiful a plastic rusty orange tube having metallic finish with a transparent strap in between. The cap fits perfectly tight and I have been traveling with it in my handbag for 6 months now but the cap has never opened in my bag. So yeah totally travel-friendly. Shade number is written on top of cap so you can locate it that ways But id you have many lipsticks from this range than it is difficult to locate a particular shade without reading it. The color is beautiful rusty orange which makes it gorgeous for day wear. the color is in-between bold and subtle which is USP for me for this. It would suit every skin tone. The shade is same as you see on the stick. 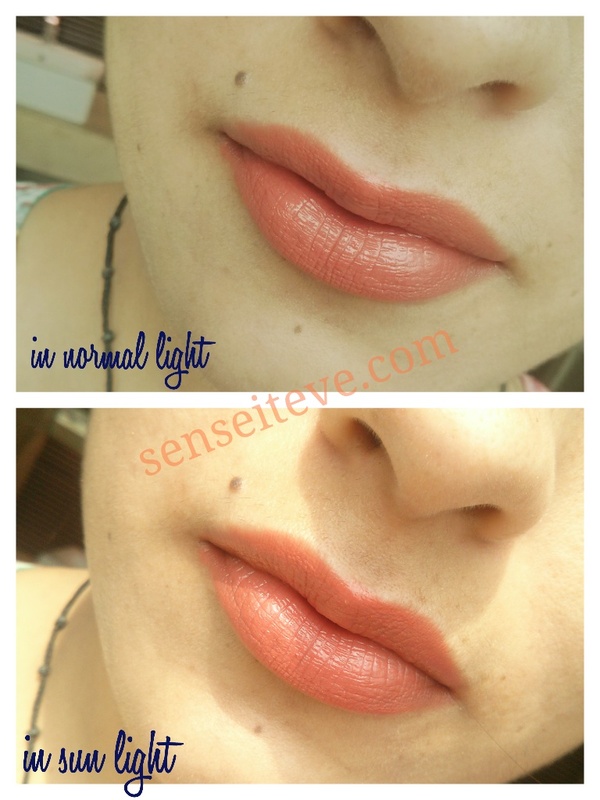 Texture of Maybelline Color Sensational Moisture Extreme Lipstick Bronze Orange is very smooth. It glides easily on lips. No tugging and pulling. Maybelline Color Sensational Moisture Extreme Lipstick Bronze Orange is very well pigmented and gives opaque finish in just one swipe but if you have pigmented lips you might love to go with 2-3 swipes. The finish of the lipstick is little glossy. Here are swathes of 1 and 3 swipes. Staying power of Maybelline Color Sensational Moisture Extreme Lipstick Bronze Orange is avergae. It stays put on lips for good 3-4 hours which little snacks and drinks in-between. When you apply it, it sets after 5 min. 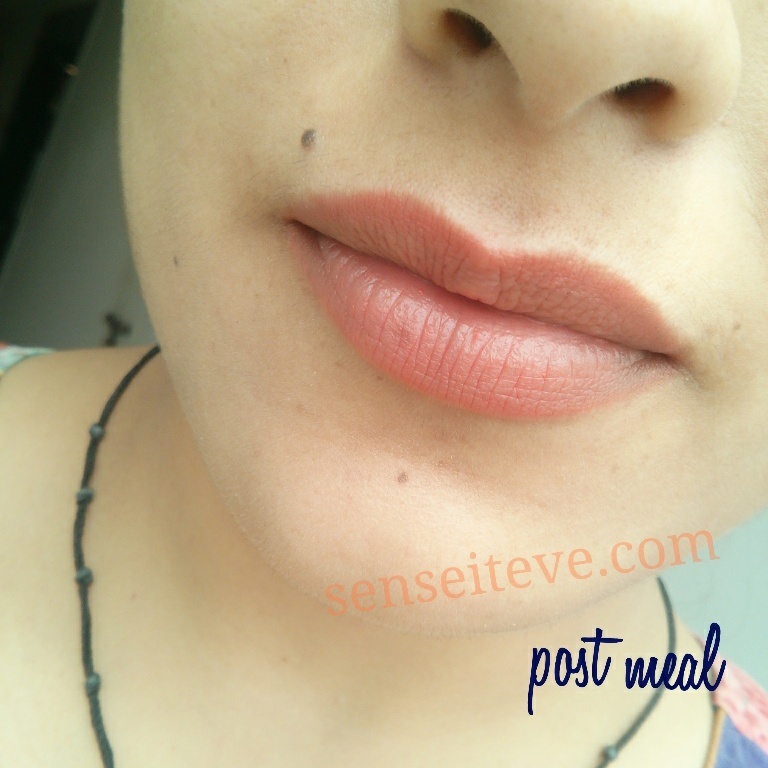 I have had my lunch with this lipstick on and post meal I could still see the orange stain on my lips so no-immediate touch up is required. And it doesn’t settle into fine lines. I am a person who eats lipstick/lipbalms 😛 (not literally, lipsticks stays a little lesser on me than other people 😀 ) so I don’t mind re-applying lipsticks. For me it gets a big thumbs up. pigmentation is great even in 1 swipe. Good enough staying power for the price tag it comes with. The range have many shade options to choose from. sets in a beautiful orange stain post meal. Smooth texture and soft finish. Hard to locate if you have many shades from this range (not a con exactly). I definitely recommend Maybelline Color Sensational Moisture Extreme Lipstick Bronze Orange and would repurchase this shade. Also I would love to try other shades from this range(they have wide range of colors in this range). 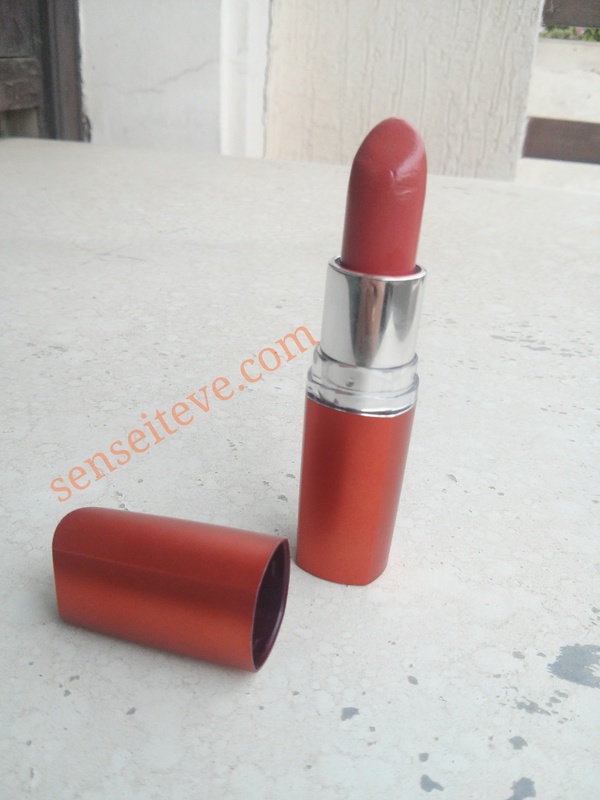 So lovelies…this is my verdict on Maybelline Color Sensational Moisture Extreme Lipstick Bronze Orange. Have you used this lipstick or any other shades from this range? What do you feel about it? Which shade should i pick up next? Please drop your comments and suggestions in comment section below. would always love to hear from you.. Yes it is 🙂 totally love it..
What a gorgeous color! I like it a lot. I love Maybelline lipsticks and this shade you picked is gorgeous. I think I will be comfortable wearing this, too, on a regular basis! This looks like a great everyday shade. I haven’t tried many Maybelline lipsticks before. Iovely color! I like it a lot. Me too 🙂 Thank you dear..
Eleonora recently posted…Demak’Up x70 – Remove your make-up! It’s a beautiful color! Looks great on you! I have this! i have this!! And I just realised I haven’t used this in a while.. I should dig it out/. Great shade, look so glam on you! Love this post! 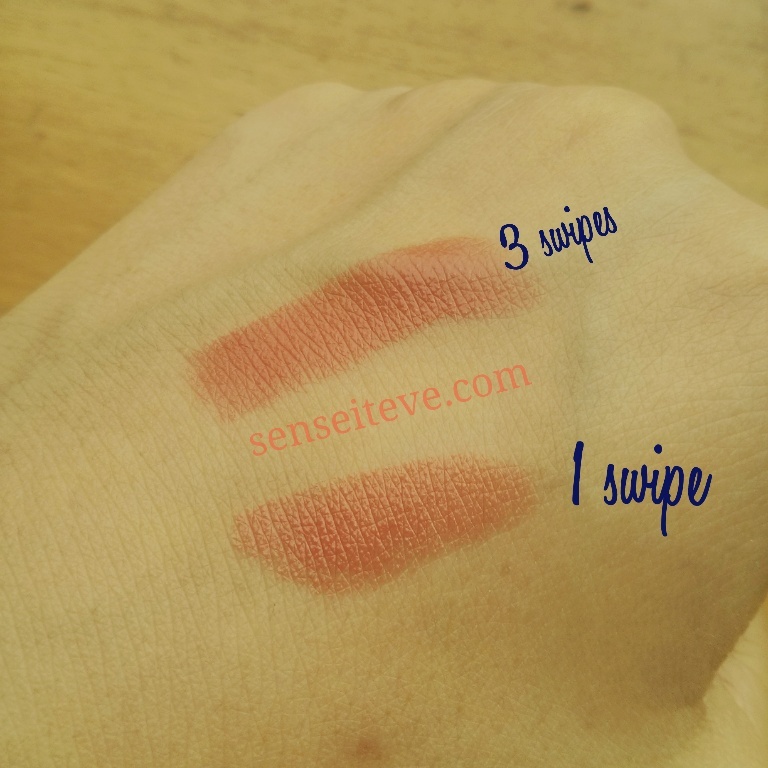 Really Really nice shade and the price.. super.. It is such a gorgeous everyday shade!!! crafty-zone recently posted…DIY’s tip: old pendant, new beads. * New post on my blog – check it out ;)! The colour suits you so well. I too love Maybelline’s budget lipsticks more because of the lovely shades available. i’m sharing maybelline on my blog today too!